Awww. 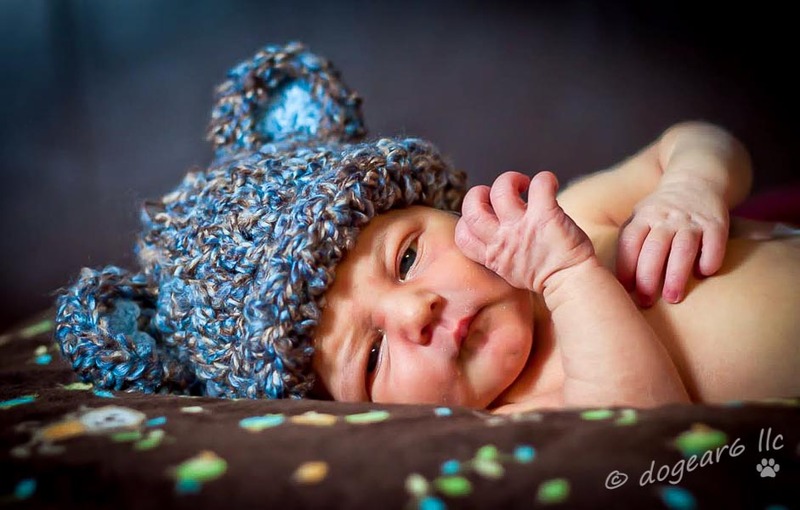 . . a baby bear hat! My son-in-law couldn’t wait to finally take this picture. My grandson is two weeks already! Him and his parents are doing well, albeit with the usual issues of lack of sleep and trying to figure out why he might be crying this time. In other words, everything is normal. This week’s photo challenge is “reward”. Last fall, I wrote a post about parenthood being the ultimate endurance test (to see my post, click here). One of the things I didn’t mention though, is that having grandchildren is one of the rewards for parenting. I’ve enjoyed watching my daughter and son-in-law learn to take care of a baby and each other. Initially, it took two of them to change the diaper. Nursing was another learning curve, as were the trips back to the doctor for both the baby and my daughter, for well baby checks and questions she had about her recovery. They figured out how to dress the baby for the cold, get him in and out of the car, plus planning ahead for what all needed to be in the diaper bag. My sister and I both remember that learning curve well. We’ve spent a fair amount of time this last week comparing how it was for our first few days home from the hospital and how our husbands learned along with us. For a further trip down memory lane, I thought I’d share some photos of my grandson versus his mother. At seven months pregnant, she was smaller than I was, although her 6″ difference in height helped her! My daughter wasn’t too enthused about how she looked right after the baby was born, but I assured her that all women look that tired, sweaty, and worn out. The fathers help take care of the baby too. Eventually Mom gets the baby back again. Aren’t the babies just cute? Lastly, here are some other pictures of my grandson for your enjoyment! I’d like to thank my son-in-law and daughter for providing some of these pictures. The uncle and grandfather are my son-in-law’s family. The aunt is my sister and the great-grandmother was my maternal grandmother. I have posts about my sister here and here; posts about my maternal grandmother are here and here. To see how others used this week’s word, click here. This post is such a treasure Nancy! I’m pretty certain it will bring you and your family joy for years to come! Thanks Maxine! It would be more of a treasure if any of my family actually read my blog. But they’re not interested in it, so I invest my time into blogging friends who do enjoy reading it. And leaving comments (thank you!). Thanks! You’re right it’s a celebration. My frustration is just in how much my family discounts what I’m doing here. What a wonderful post! As a memory keeper, it’s awesome you have the photos on hand to make the comparison and tell your lovely family story! Well done! Thanks Connie! I appreciate the compliment. It started because my daughter was complaining how crummy she looked after having the baby. So I dug out that picture from my laptop to show her that no, it wasn’t just her. Then I started thinking hmmm. . . I have pictures of my son-in-law’s brother holding the baby and my sister holding the baby. And my son-in-law is holding the baby and there’s my husband holding the baby. And it just went from there, all because I was looking for that first picture. I’m glad you liked it! Thanks for taking time to look at it. Babies are the best reward ever! Of course, the opportunity to be a parent is right there too. Your photos are beautiful, and so is your family. Thanks for sharing this awesome reward; enjoy the love! Thanks Gale, for the compliments and encouragements both! Congratulations! Your grandson is an adorable, wonderful reward! I love all the photos but that first in the little cap is my favorite. Nice to meet you. Thank you and nice to meet you also! He’s adorable! The pairing of pictures is such a great idea! YOU’RE BACK! Oh how sweet. Nice to see you Lynda and thanks for the note. I hope you are doing well and adjusting to your new life without your sweetie. And thanks for the compliment on pairing the pictures – I’m glad you liked it! How sweet – I’m insanely jealous of your little one – don’t blink or he’ll be 21 and 6′ tall !!! NO FOOLING. I can’t believe I’m the mother of a 30+ old woman who’s 5’10” (she was taller than me before 8th grade). They grow up so very fast! Another blogging friend commented on how the learning curve is the same and it sure is. We all do remember how hard it was getting used to that new little being that we made. And pass the baby is a game that never grows old. I’m glad you liked the pictures of now and then. Whenever I do something like that, I wonder if this will be the time everyone thinks its stupid. But the comments have been good – thanks for letting me know you liked it too! Oh Nancy, your grandson is beautiful! Did I miss it, what is his name? Thanks for sharing all of the wonderful photo’s and I loved the then and now comparisons! Hugs! You’re welcome! I’m glad you enjoyed them and enjoyed the comparisons. His name is a combination of a name from men of science plus my husband’s first name. It sure made up to an unusual combination! What a heartwarming post, Nancy! I love the side-by-side comparisons. Such a happy time for you and your family! Thanks Debbie! I’m glad you liked them. I sure had fun pulling them together. I love the comparison. There are some things that remain the same through out the generations. What a beautiful family! Thanks Colleen! I had fun doing the side-by-side comparison and I’m glad you liked it too. You’re right though – some things do remain the same, from being wiped out afterwards to playing pass the baby. And that’s how it should be too! I hope those things never change. I hope you do some more side by sides as the baby grows. I should do more. I was surprised at how well this post was received and would love to show more of those types of pictures (assuming I can match more up!). Wow! What a great post and fabulous pictures!! Keep them coming. I love the mixture of the old and new pictures. The baby is adorable and I´m happy to hear everyone is doing fine. Sending hugs to all!! Grandchildren are definitely a huge reward. Thanks Darlene! As I mentioned to another commenter, it started out because I was showing my daughter how bad I looked after having her. Then I realized how many similar pictures I had and it just seemed fun to put them side-by-side. And of course, with you, grandchildren and great-grandchildren are a reward you share with us frequently! I’m glad you liked it. It started out because I was showing my daughter how bad I looked after having her. Then I realized how many similar pictures I had and just went from there! So I’m glad you let me know it turned out good. I love seeing all those pictures of you and your family. Thanks Mlissabeth. I appreciate that comment. Sometimes I wonder if I post the family photos too much, so I’m glad to hear you liked them! When she graduated college, we turned to each other and said, “and think, no one went to jail for manslaughter.” We laughed and laughed, making my Mom turn around to shush us. From what I’ve been told, grandchildren will be much easier, if only because you can give them back at the end of the day! Congratulations, Nancy! Your grandson is absolutely adorable :) So glad parents and baby are doing well. I, too, remember that learning curve! Beautiful then and now photo gallery too! Thanks Stacy! I’m surprised how much I remember considering it was so many years ago that she was a baby. But until they do it themselves, there’s no way to really describe how much a baby changes your life. It was hard, especially since I didn’t get to hold him much while the kids were figuring out how to take care of him. But after being there the weekend before she had him, then coming back for another ten days, I was happy to be back home.